With death only a heartbeat away, Gene and the remaining humans must find a way to survive long enough to escape the hungry predators chasing them through the night. But they’re not the only things following Gene. He’s haunted by Ashley June who he left behind, and his burgeoning feelings for Sissy, the human girl at his side. Their escape takes them to a refuge of humans living high in the mountains. Gene and his friends think they’re finally safe, but not everything here is as it seems. And before long, Gene must ask himself if the new world they’ve entered is just as evil as the one they left behind. As their enemies close in on them and push Gene and Sissy closer, one thing becomes painfully clear: all they have is each other…if they can stay alive. Ok. I read the first book and was hooked at the beginning, but then was a bit disappointed further through the book. However, I decided to give the second book a chance and I'm glad I did. I'm not quite sure what it is about this series, but I just have to know what happens. All the vampire quirks really freak me out and I think they are pretty weird, but that's the awesome thing about this series; It's in a league all it's own. It's also totally unique. The Prey picks up where The Hunt left off. And right from the first sentence I was hyperventilating. Talk about your scary vamps! YIKES! Aundrew Fukuda does an incredible job of scaring the ever living daylights out of me. Well done Mr. Fukuda, well done. Getting to know Sissy better. I loved how her character is more prominent in this book and I have to say I really love her character! She is a true leader and takes charge of those around her. She's also fearless and does what she things is right! The non stop suspense. There was never a time where the humans could just relax. I'm not kidding, even now just typing about it, my heart is thumping hard. Scared me to death! The mystery of the Scientist. Okay, Gene's father is amazingly intelligent. And I love where Mr. Fukuda took this character in this book. The Mission really creeped me out. I was really not wanting to read those chapters, but now I totally understand why they were doing the things they were. The old men though....gross. Ashley June. That's all I'm saying. All in all I liked this book even better than the first book! And I have to say that I will be reading the third book because I NEED TO KNOW WHAT HAPPENS! Adrew Fukuda's writing is addictive. Fukuda takes us on a mind-bending and intense ride as readers trace back the history of this vampiric world. Prey gets off to an electrifying start; it is well paced and well plotted. The writing is clear and precise. It provides a lot of suspense and characterization without being too wordy or over powering. One favorite description puts it all into perspective, " Darkness, vicious as far, smeared in a thousand layers over my eyes." Fukuda magically weaves words together to creative a vivid image in the reader's mind. The books opens as Gene, Sissy as e boys are on the run from the Heper Institute. Having barely escaped with their lives, they make their way down the river, seeking the sanctuary that the Scientist promised them was out there. Their journey is not an easy one. They are still being hunted. In a world where things are not always what they seem. Can they trust the Scientist? Will they find the paradise he promised?. 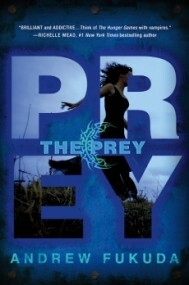 The Prey allows the readers to connect to the characters on a deeper level than in The Hunt, making this an incredible sequel. The plot is completely driven by a great assemble of colorful characters from our protagonists like Gene and Sissy , to new characters one just loves to hate. The Prey is a truly enjoyable read. It takes a whole different approach to the vampire .genre's current trend and returns back to the traditional view of vampires with a new 21st addition. The two books aren't only about blood thirsty vampires; Fukuda also intertwines a few object lessons about humanity as well.The Prey is a never ending sequence of action and suspense;it will give the reader a thrill unlike any other they've experienced before. Lately I've been reading tons of dystopian novels with vamps. This is just a sign that if a novel is well written, it doesn't matter if the market is saturated with books with similar premises. Well, make that three. This is one amazing tale. Nail biting tension that starts at the beginning and builds to an explosive climax. I swear I squirmed in my seat more than a few times. The book starts right where THE HUNT left off. Gene is on the run with Sissy and some others to find the magical place where vampires don't exist. Word has gotten out that the royal vampire family have a hidden human breeding farm. Yes, these vampires don't just settle for blood. The fast pacing keep you turning the pages. I couldn't stop! Think Hunger Games meets vampires. Razor sharp descriptions haunt you long after you finish this novel. I could see and hear what Gene goes through while on the run. Gene and the others end up finding a place hidden from the vampires. Rumor has it the scientist wanted them to find this place. But something is off. Gene and Sissy look to see what's really going. All the while Gene still feels guilt for leaving Ashley June behind. There's so much that worked in this follow up novel. First, the imagines are so clear that I dare anyone not to squirm while reading it. This novel is a great example of what to do when writing a sequel without dumping tons of backstory at the beginning. The chemistry between Sissy and Gene builds. I don't think it would have worked if the romance happened too fast. Especially since Gene still can't forget about leaving Ashley June behind. Another thing that really worked was the whole premise of the gene mutation that caused humans to die off and turn them into vampires. These vamps are very bright and determined. The scene where they stalk Gene and the others is intense and very chilling. And yes, kind of disgusting too. These vampires won't give up and will continue the hunt even when the sun comes out. Hunks of their flesh melts and still they try to grab a human even when the sun rays turn them into a yellow goo. The compound Gene and the others stumble on has some clues at what really waits for Gene and the others. The clues add up to a very haunting revelation that took me off guard. This must read series should have a warning label: Not for the squeamish but guaranteed to grab you and not let you go.